↑ Orloff, Richard W. (September 2004) [First published 2000]. "Table of Contents". Apollo by the Numbers: A Statistical Reference. NASA History Division, Office of Policy and Plans. NASA History Series. Washington, D.C.: NASA. LCCN 00061677. आई॰ऍस॰बी॰ऍन॰ 0-16-050631-X. NASA SP-2000-4029. अभिगमन तिथि June 28, 2013. 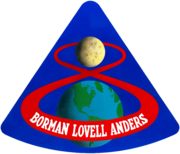 ↑ "Apollo 8 Press Kit" (PDF) (Press kit). NASA. December 15, 1968. पपृ॰ 33–34. Release No. 68-208. अभिगमन तिथि June 28, 2013. – The spacecraft mass at launch includes the CM and SM, but excludes the 4,000 किलोग्राम (8,900 पौंड) Launch Escape System (LES), which was discarded before reaching Earth orbit. 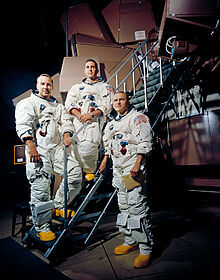 ↑ "Apollo 8 Mission Report" (PDF). NASA. February 1969. पृ॰ A-14. MSC-PA-R-69-1. अभिगमन तिथि June 28, 2013. – The mass for LTA-B was less than that of a flying LM, because it was essentially a boilerplate descent stage. A fully loaded, flight-ready LM, like the Eagle from Apollo 11, had a mass of 15,095 किलोग्राम (33,278 पौंड), including propellants. 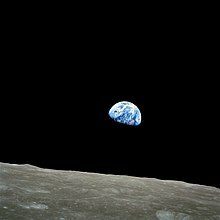 ↑ अ आ इ "Apollo 8 Mission Report" (PDF). NASA. February 1969. पृ॰ 3-2. MSC-PA-R-69-1. अभिगमन तिथि June 28, 2013. ↑ "Apollo 8 Mission Report" (PDF). NASA. February 1969. पृ॰ 3-1. MSC-PA-R-69-1. अभिगमन तिथि May 8, 2015.